ABOVE: Reader Laurent Mousson writes: "The cloud in the painting on the wall of the Nationalrat features a naked angel-like creature that is undoubtedly female (the artist obviously thought of giving the bored lawmakers some reason to attend the sessions.) You need a minute or two to spot it." Switzerland has a long tradition of democracy. The Swiss Constitution was written nearly 150 years ago, when the old confederation of independent cantons was replaced by a federal state. "The finest edifice of modern construction in Bern is the Federal Palace, two great buildings on a commanding height, where the Swiss government is located, with the chambers of the two National Legislative Assemblies. It was here that the International Postal Union was founded in October, 1874. These structures are known as the Bundeshauser, being respectively called the East Building and West Building. A fountain figure of Berna in heroic bronze adorns the front, and from the terrace there is a magnificent view of the mountains." If you're wondering why the Bundeshaus is described as "two great buildings," there's a simple explanation: The central connecting portion of the structure, with its massive dome, wasn't completed until 1902. 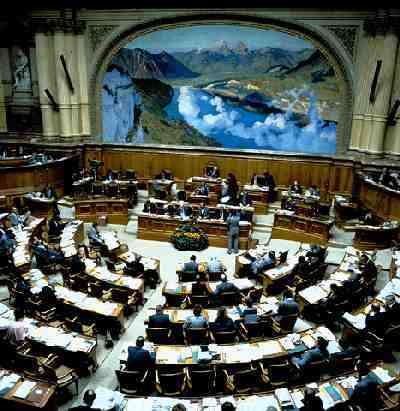 This 20th Century addition contains the chambers of Switzerland's two legislative bodies: the Nationalrat and the St�nderat, which are comparable to the U.S. House of Representatives and Senate. The larger of the two chambers has a huge fresco by Charles Chiron titled "The Cradle of the Confederation" (see photo), which shows Lake Lucerne and its surrounding mountains with a passing cloud formation to liven up the scenery. Baedeker's Switzerland (1911 edition) suggests that the painting is "best seen from the visitors' gallery, opposite," and that advice is worth heeding today. If you visit the Bundeshaus when Parliament isn't in session, you can take a free tour that includes the legislative chambers. When Parliament is in session, you can watch the lawmakers from the public galleries. For more information, see the Swiss Parliament's official Visiting the Parliament Building Web pages. The city of Bern has a vegetable and flower market on the Bundesplatz most Tuesday and Saturday mornings. The terrace behind Parliament, 157 feet (48 meters) above the River Aare, offers a great view of the river and its valley.